Professional stuntmen don’t want to cross it and Lance Armstrong wouldn’t bike it even after doping up: West Colfax Avenue. It needs to change, and residents can help decide how it will, tonight at an event called Reimagine West Colfax. It’s the first of two meetings that will decide what type of temporary infrastructure — a crosswalk or a protected bike lane, for example — will be installed for one day in August. The idea is that the one-day demo will lead to permanent, basic infrastructure necessary to keep pedestrians and people on bikes safe. “Our ultimate goal is to actually see long-term changes on Colfax that make things more bike and pedestrian friendly,” said Jill Locantore of WalkDenver, who partnered with the West Colfax Business Improvement District on the effort. Overly wide streets, poorly timed traffic signals, and the absence of crosswalks are the main barriers to safety on the street, which is one of RTD’s busiest corridors, Locantore said. The project begins with brainstorming with businesses and residents, then moves on to a design workshop with urban planners and engineers, and then loops back for more input and revised plans from residents and businesses. Finally, at the end of summer we plan a community celebration when we will “test run” and install temporary versions of the designs on the street for one day. 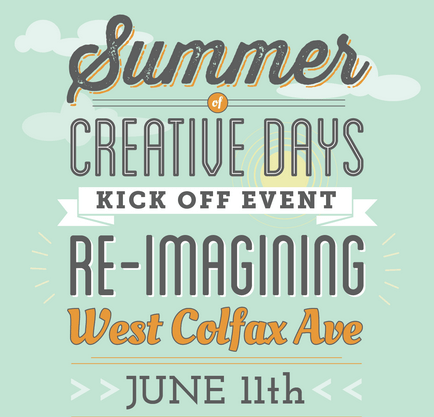 Reimagine West Colfax happens tonight from 6 to 8 p.m. at Confluence Ministries, 1400 Quitman St. The Department of Public Works, RTD, the Colorado Department of Transportation, and several design firms will participate pro bono. The Gates Family Foundation also is providing support. Yes! Join us tonight to re-imagine West Colfax with partners PlaceMatters, Radian, GroundWorks Denver and WalkDenver. Just for one day? I think this is where Denver lacks in gusto for road infra. One day is simply not enough time to collect enough data and make necessary adjustments to any potential new infrastructure the city may be seriously considering. I’m sure once it’s done, the small percentage of politically active people who advocate for bikes could walk around and pat each other on the back about how great it was to have something like a safe street for a day, but test projects take longer. Seattle’s 2nd avenue protected bike lane: pilot test to before implementing permanent physical infrastructure. Vancouver’s Burrard St. protected bike lanes: over a year of “tests” before becoming permanent. Portland: all of Portland is initially rolled out as a “test”. That’s how cities work. Lay down some paint and tweak it till the money is available to put down some cement, that’s what gains traction and a change in mode share.